The International 15th Silk Road Golden Man of the Year Awards were presented by Silkroad Strategic Research Center and Silkroad Broadcasting Group. Many politicians, civil society leaders, diplomatic representatives, businessperson, members of the media from Turkey and the Turkish world were attended to the event which was held in Istanbul Ceylan Intercontinental Hotel. At the Night where The Civil Society Award of the Year was received by Dr. Akkan Suver from the Marmara Foundation, Şamil Ayrim, the member of the Marmara Group Foundation also received an award. 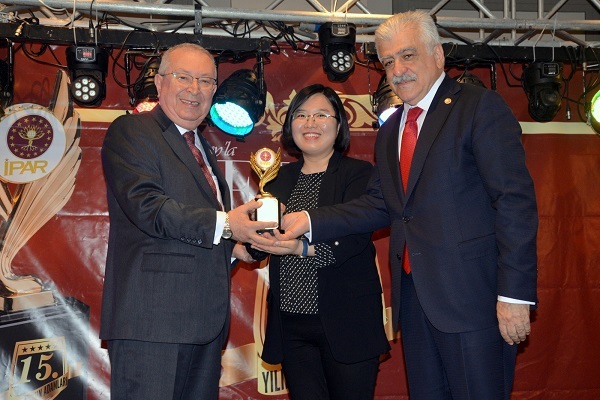 Irina Vlah, the President of the Gagauz Autonomous Region of the Republic of Moldova, received an award for her service to the country and to the Turkish world at the Awards Ceremony in which Engin Köklüçınar, the Vice President of Marmara Group Foundation were present. The Honorary Doctorate was given to Seyfullah Türksoy at the ceremony by Prof. Dr. Elçin İsgenderzade, President of the International Science Center.